DES MOINES – The Iowa Barnstormers have officially opened internship positions for the upcoming 2019 season. The Iowa Barnstormers are looking for energetic, professional, and self-motivated interns to assist with the 2019 Indoor Football League season. The team offers internship opportunities in sales, marketing and promotions, media relations, video production, and equipment management. Internships are open to college students who are currently pursuing a degree in or have a strong interest in sports, sales, marketing, or a related field.Interested applicants are expected to submit a cover letter along with their resume. 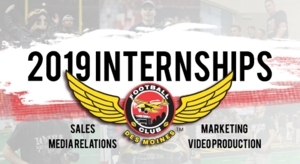 Further information on all of the Iowa Barnstormers 2019 internship opportunities can be found by clicking the links below. Please specify which internship(s) you are applying for in your cover letter.